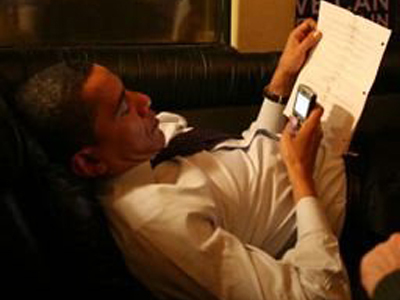 Friday's lousy jobs report was a big blow to President Obama's reelection campaign. One of the single biggest factors in a President's reelection chances is the direction of the unemployment rate and monthly jobs numbers in the six months leading up to the election. We're getting very close to the six-month mark now. And, from Obama's perspective, the jobs numbers are headed the wrong way. The Obama administration will continue to tell the same story that they have told from the beginning: The economy isn't healthy enough, but it's much healthier than it was under the Republicans--and Obama said from the beginning that it would be a long, slow slog. That's the truth: It was always going to be long, slow slog. The country's huge debt load, housing collapse, and financial crisis were always going to take years (if not decades) to work through, no matter what policymakers did. But the trouble for Obama is that he didn't manage the country's expectations well enough, especially with respect to unemployment. On the contrary: He overpromised and underdelivered. Last fall, Ezra Klein of the Washington Post wrote an excellent treatise on how the American economy collapsed. Klein included what might be described as "the chart that will get President Obama fired." The incoming Obama Administration's projections for what the unemployment rate would be if no stimulus was enacted in the depths of the financial crisis (light blue). The Obama Administration's projections for what the unemployment rate would be with the President's stimulus plan (dark blue). The actual unemployment rate (through early 2011--it's now 8.2%). The actual unemployment rate in the chart, you will note, is much higher than the "nightmare scenario" initially envisioned by the Obama Administration (with no stimulus). In either case--stimulus or no stimulus--the unemployment rate was supposed to be down to 5.5% by now. And it's actually above 8%. As the chart makes instantly crystal clear, the Obama administration drastically underestimated how bad the economy was and drastically overestimated its ability to do something about it. As a result of this, President Obama over-promised and under-delivered on the single most important challenge of his Presidency. 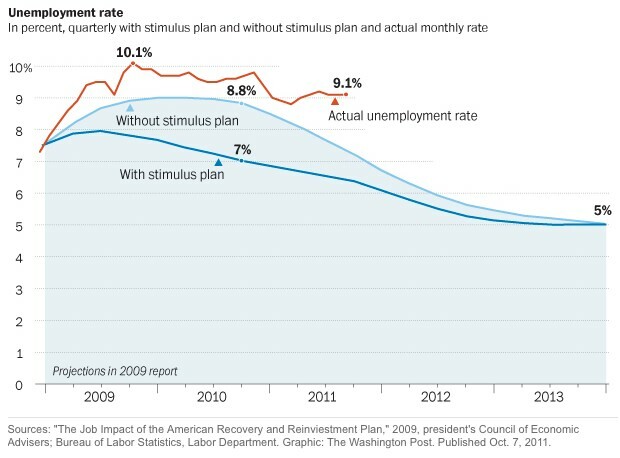 Also as a result, President Obama gave the Republicans ammunition to argue that his stimulus "failed," when, in fact, it helped matters considerably (just not enough to fix everything). Could the Obama Administration have fixed the economy in four years had they had done something different? As a quick glance at debt-to-GDP charts show, this recession was not a run-of-the-mill cyclical recession. It was a debt-fueled balance sheet recession. And if there's one thing history shows about those, they take a long time to fix. (See Japan and the Great Depression). But Obama could have given himself a better chance to get re-elected despite the horrible economy. If Obama had recognized how bad things were, asked for a much bigger stimulus than he ended up asking for, and, importantly, set the appropriate expectations, he'd probably have been able to pin the blame for the mess where it belongs: On the three decades of decisions that facilitated the debt build-up that eventually culminated in the financial crisis. Instead, however, Obama over-promised and under-delivered. And this will make it that much harder for him to get re-elected.